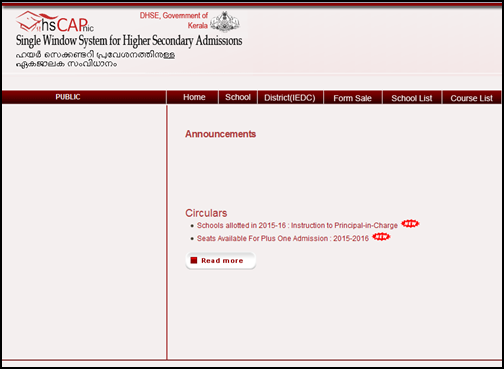 Kerala state plus one admission 2015 – 16 online registration will be available at HSCAP, the official website of Education department for higher secondary admission. The online submission of applications forms for admission in merit quota commences on 12th May 2015. Students, who applying for the plus one admission under single window system, can submit their application on the HSCAP website from 12th May 2015. As the Kerala SSLC exam results got published, the department of higher secondary education is currently under the process of inviting applications for the Plus One seats. Duly in charge of undertaking the admission procedure of higher secondary education, the department facilitates proper requirements which will enable the students and parents to get admittance to their desired course and school. A total of 3.61 lakh seats are available for first year students in Government, Aided, Residential/Special/Technical/Unaided sectors. 2.4 lakh seats are exclusively reserved for the under the Single Window system. The Kerala Plus One admission for the current year conducted through the single window system will start on 12th May 2015. The system popularly known as Ekajalakam is a online registration procedure which would help students to know their status of admission in speedy time. As this system has proved to be simple and transparent, candidates can choose courses according to his/her interest. With 7210 batches in 2067 higher secondary schools, 3.61 lakh seats will be available for the students who are eligible for higher secondary education. As the results of CBSE, ICSE gets declared, the number of students applying for Kerala plus one course is expected to rise. According to the latest notification from the higher secondary department, the online submission of application will be closed on 25th May 2015. The trial allotment of Higher Secondary / VHSE courses will be published on 3rd June 2015, while the first allotment on 10th June 2015. After two more allotments, the classes are expected to begin by 1st July 2015. For those students who are applying for the Kerala plus one course, a close look at the following important dates is very important. All the online proceeding of the Kerala state plus one admission 2015 – 16 will be done through HSCAP, the official website of Education department for higher secondary admission. Students need to visit the official website for submitting their application.